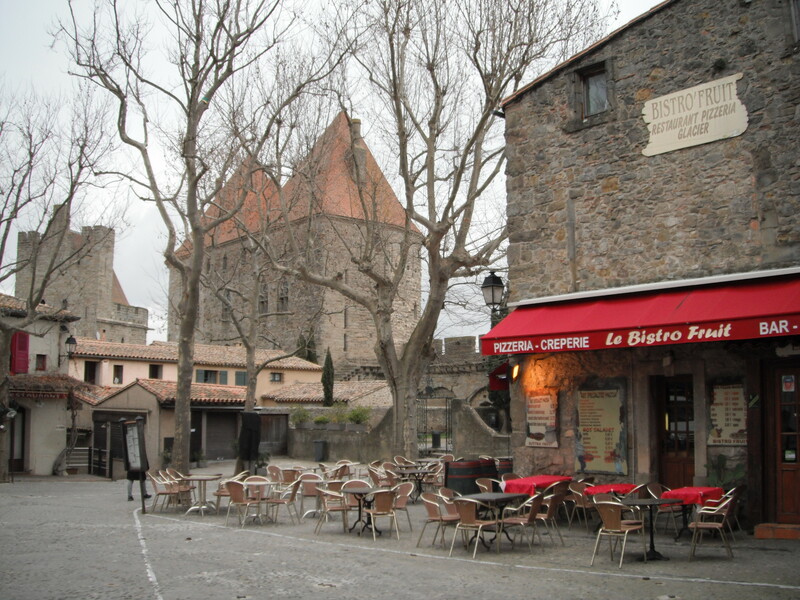 The main reason for any visit to Carcassonne is to see La Cité, a huge fortified city, high on a hill overlooking the main town and the canal du midi. I’ve been there many times and I never get tired of strolling around the cobbled lanes and the lises (the wide area between the inner and outer walls). La Cité began life as a Celtic settlement which was then fortified by the Romans. In the 11th Century, Raymond Bernard Trencavel took possession of the site and built the Chateau du Comtal and the Cathedral of Saint Nazaire. 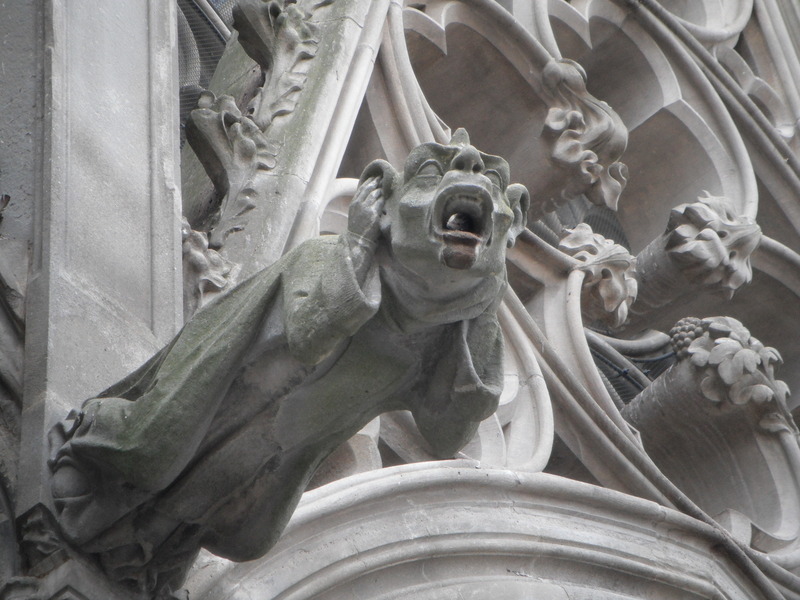 He also allowed the Cathar community to seek shelter there during times of persecution. In the 13th Century, Simon du Montfort initially took control of the city and added more fortifications but when King Louis IX replaced him, he built a new city beside the river below, what is now known as the Basse Ville. 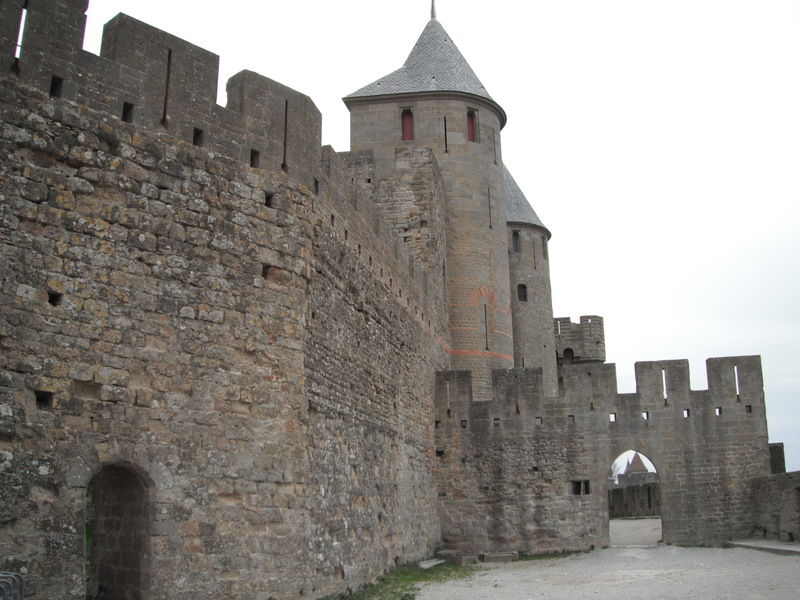 During Napoleonic rule, Carcassonne was struck from the list of official fortifications and La Cité fell into disrepair and a decision was made to demolish it. Luckily, the locals led a campaign to preserve the fortress as a historical monument and in 1853 the architect Eugène Viollet-le-Duc was commissioned to oversee the restoration. After his death in 1879, other architects were able to continue his work, following the numerous notes and drawings that he left behind. The restoration was strongly criticised during Viollet-le-Duc’s lifetime. He made the error of using slates and restoring the roofs as pointed cones, where local practice was traditionally of tile roofing and low slopes, in a snow-free environment. However, whilst Viollet-le-Duc’s restoration of Carcassonne may not be authentic, it is agreed to be the work of a genius. In the summer, La Cité is crowded with tourists, squeezing between the overpriced guide books and postcards displayed outside the many souvenir shops and listening to their audio guides as they visit the Chateau du Comtal. Place Marcou is packed with tables, and waiters run back and forth between them and the many restaurants which line the little square. In winter La Cité is deserted and I see only a dozen people, two of them jogging around the lises. The shops are all closed up, except for a few near to the main entrance gate, and only a few restaurants are open for business. I arrive during lunchtime and, while I wait for Saint Nazaire to reopen, I decide to warm up with a steaming bowl of cassoulet. Several types are on offer but I choose the traditional one, which is also the cheapest. 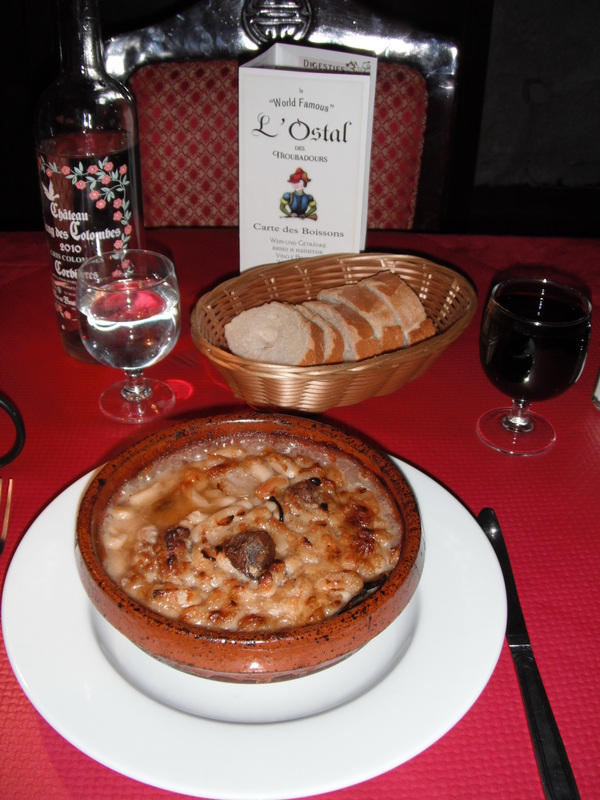 There are some arguments as to where cassoulet originates from but generally, it is agreed that there are varying recipes from the three places along the canal du midi; Carcassonne, Castelnaudry and Toulouse. My cassoulet is very nice and the restaurant is atmospheric with small windows overlooking the chateau and dark wooden beams. However, I am serenaded by the most awful muzak. Given that the restaurant is named L’Ostal des Troubadours, I would have thought some medieval tunes may have been more appropriate. This entry was posted in Food, France and tagged Carcassonne, Cassoulet, Castelnaudry, Chateau Comtal, European Nomad, France, Prosper Montagne, Saint Nazaire, Simon de Montfort, Toulouse, Viollet'le'Duc on January 30, 2015 by A Nomad. 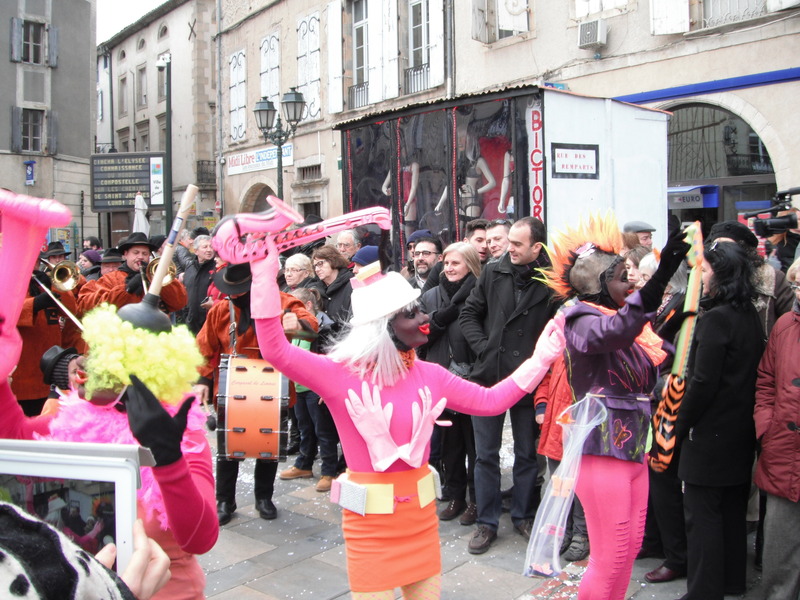 Every weekend from January to March, it is carnaval in Limoux and I arrive in the large town on a cold winter Sunday. Inside the 15th century church of St Martin they are getting ready for mass, but outside in the colonnaded Place de la Republic, crowds are gathering in excited anticipation of the first parade of the day. Tradition dictates that the theme of the first parade is grotesque in style and the scene has already been set by the placement of a stage of prostitute models and a Madam suspended from a balcony, legs spread wide, offering local specialities! A little later than scheduled, one of the many local groups partaking in the carnaval, Les Femmes (The Women), emerge from one of several bars in the main square. They are dressed in fluorescent colours, with afro wigs and carrying inflatable musical instruments. A brass band accompanies them as they slowly dance to the next bar and then disappear inside. Ten minutes later they emerge and continue their parade to the next bar. They visit five bars in total and it seems more like a pub crawl than a parade. I return to the square in the afternoon, for a second parade. 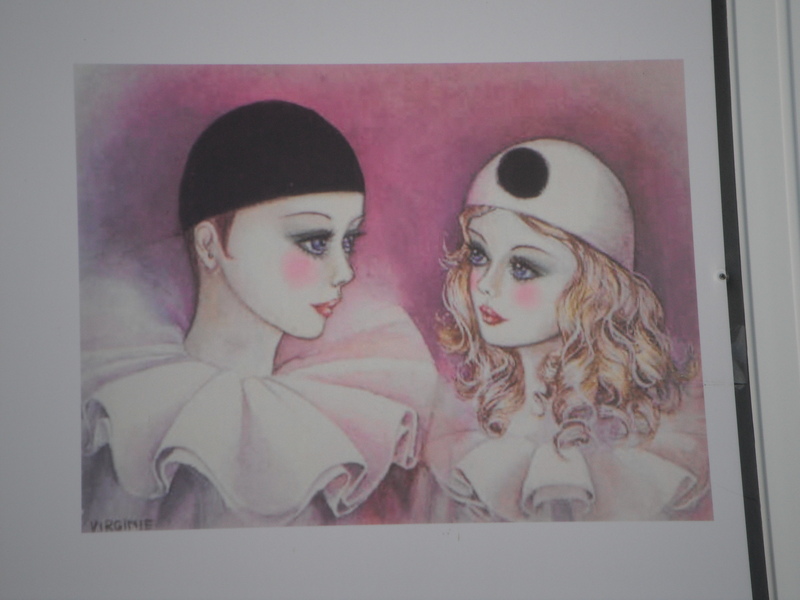 This time they are dressed in traditional white pierrot costumes, with beautifully painted masks. As they pass, they sprinkle the spectators with white confetti, which settles on the pavement and looks like snow. I’m surprised at how many people are braving the freezing temperatures to see them. I’m driven inside in search of something warm. 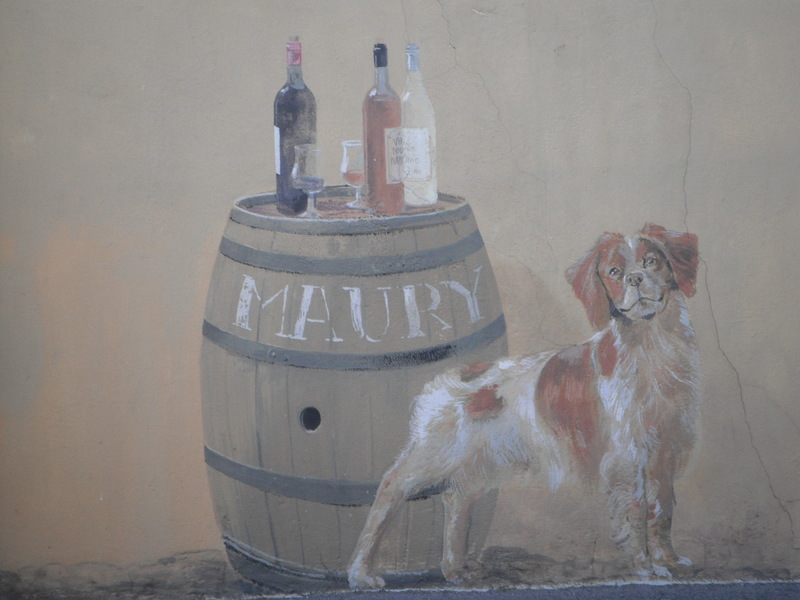 Limoux is well known for its sparkling wine, blanquette de Limoux, but I opt for the hot red wine and slowly sip it while watching through the window for the parade to pass by outside. However, it doesn’t pass, but instead the bar doors are flung open, allowing in the cold air and the parade. Drinks are lined up on the bar for them and they seem in no rush to go back outside where the spectators are waiting for them to re-emerge. The third and final spectacle of the day takes place at 10pm and is by torchlight. Much as I want to return and watch, I know that I will be more tempted by the prospect of a warm bed. On Sunday 22nd March, it will be the night of the Blanquette, when the best group, as voted by the local people, will be presented with a prize for all their efforts and the sparkling wine will be flowing in celebration of a successful carnival. 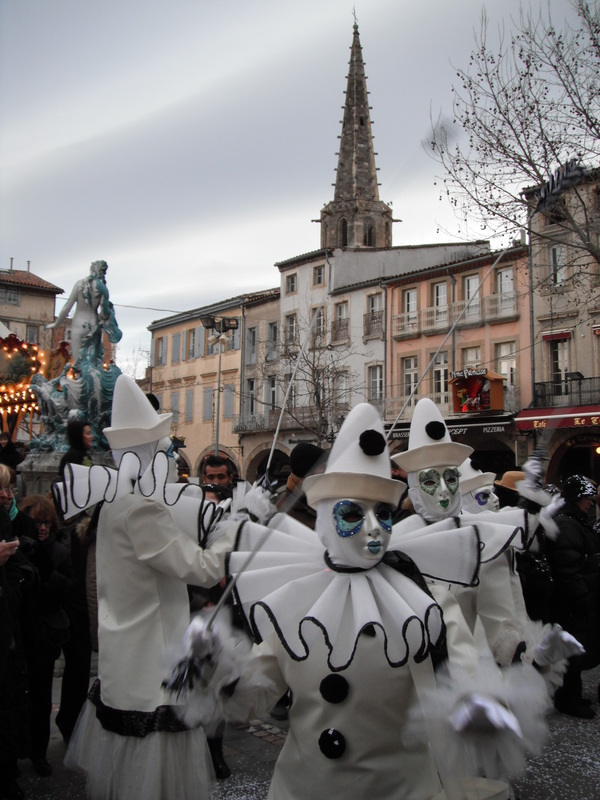 This entry was posted in France, Wine and tagged blanquette, carnaval, Carnival, European Nomad, Limoux, pierrot on January 30, 2015 by A Nomad. 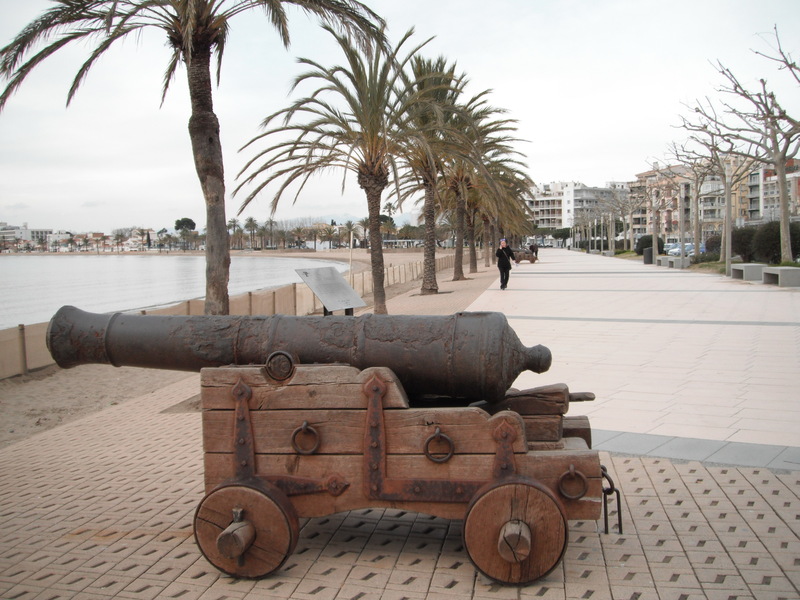 When entering France, I had planned to spend some time on the coast between Perpignan and Narbonne. However, Mother Nature has other plans. Despite the glorious sunshine, it is bitterly cold. That alone would not deter me, but the fierce north wind, averaging 50 km/hr does. My motorhome is not really designed for this weather. While being small and agile is good for driving, Trixie cannot really cope with the wild winds. 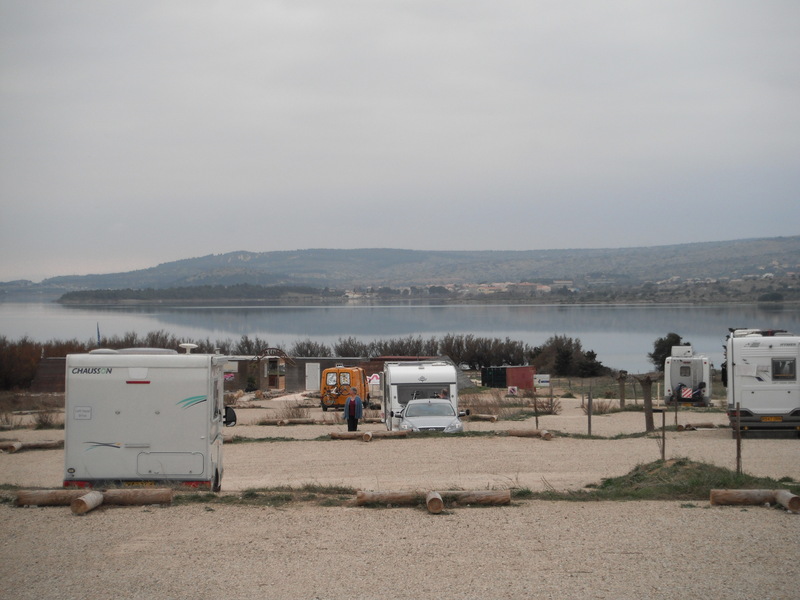 My first choice of overnight stop, just outside the village of Leucate, with great views overlooking the etang, turns out to be too exposed and after 30 minutes and having checked the weather forecast, I realise I need to move. About 10 kms north is the town of Port-la-Nouvelle, the third largest Mediterranean port in France and not really very pretty. But here I find an aire that is slightly more sheltered. It’s not a very good night, with the wind buffeting the motorhome and the noise from passing trains and fuel trucks, I get very little sleep and wake up feeling a bit seasick! My only option is to give up the wide open, sunny, coastal plains and head for the mountains in the hope for a little more shelter. I take the main road from Perpignan to Foix, which follows the River Agly and the narrow gauge railway tracks for a little red tourist train, but there’s no train today. It only runs during the summer months and for a special Santa service at Christmas. 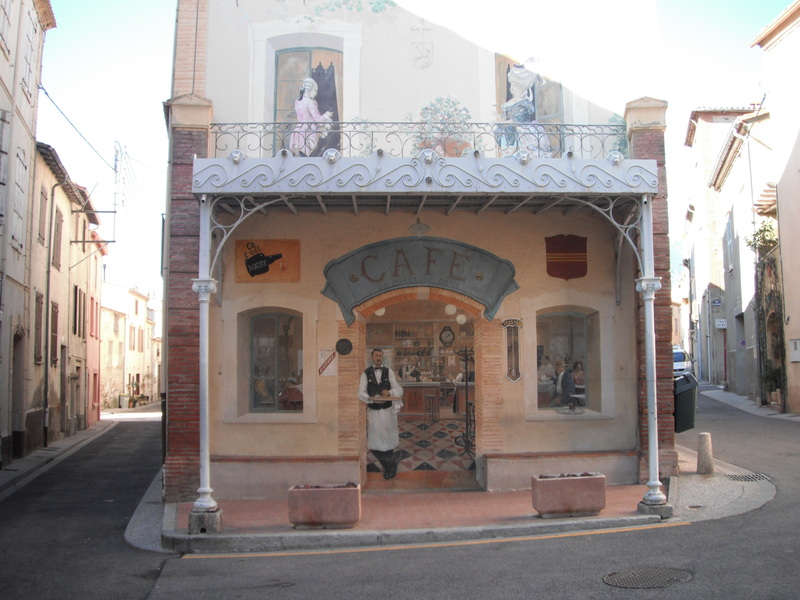 I stop in Maury, to pick up some information for the region, and discover that there are numerous trompe l’oeil paintings to be found along the village streets. I brave the wind and go in search of some. They are large and imaginative, and certainly liven up the dull concrete walls. A large thermometer hanging outside one of the houses reads 5 deg C, but with the wind chill it feels more like -5 deg C.
I continue towards Foix, in the shadow of some of the Cathar Castles. 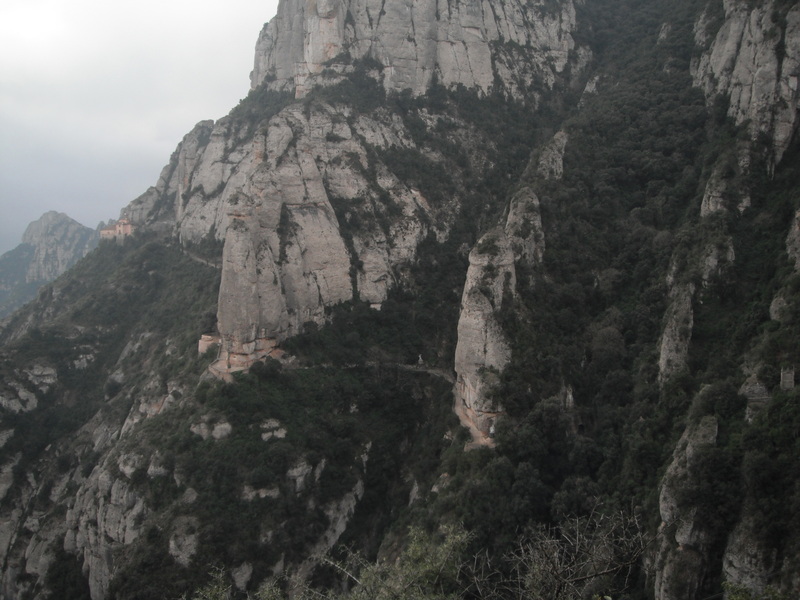 To the north are Queribus and Peyrepertuse, and to the south is Puilaurens. 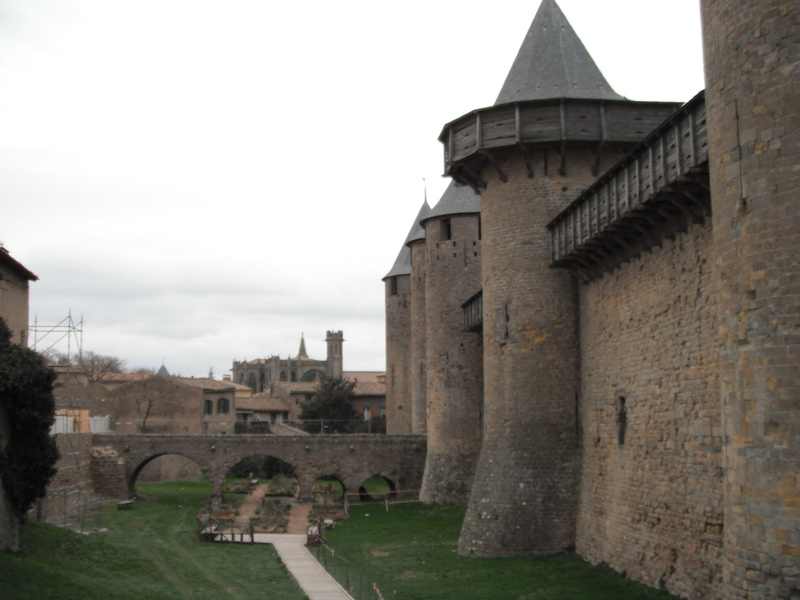 These are three of the castles known as the five sons of Carcassonne and I was lucky enough to visit them 7 years ago while leading a walking tour in the area. 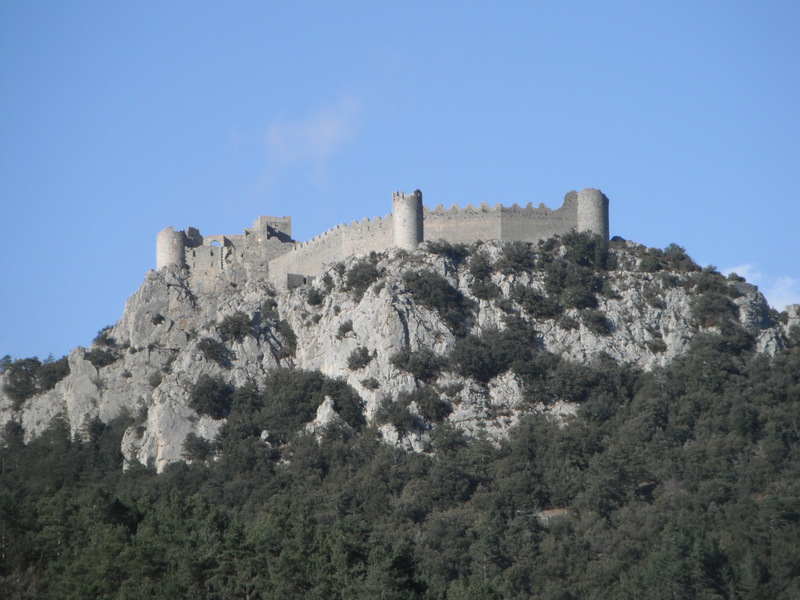 Further to the west is the ruined fortress of Montsegur, where the Cathars retreated from the Catholic French troops and withstood a long siege before surrendering and being burned to death after refusing to renounce their faith. Some believe that a secret treasure was smuggled out of the castle at that time and hidden in the nearby mountains. Treasure hunters have scoured the area for years, hoping to find it, including German Otto Rahn who visited Montsegur in 1929 and linked it with the Holy Grail. Maybe the real treasure is the wealth of history to be found in the region and perhaps the publication of the hundreds of books about the local mysteries. 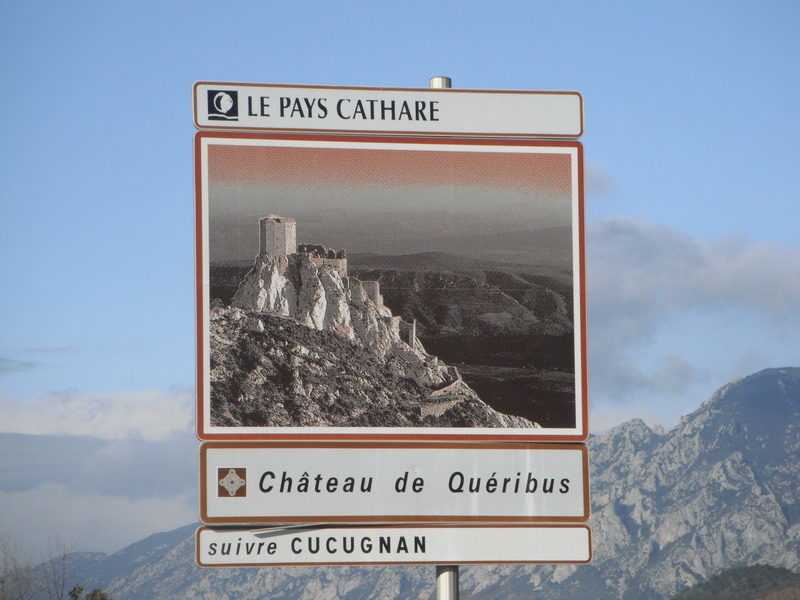 This entry was posted in France, Religion and tagged Carcassonne, Castles, Cathar, Cathar castles, European Nomad, Foix, France, Holy Grail, Leucate, Maury, Montsegur, Otto Rahn, Peyrepertuse, Puilaurens, Queribus on January 30, 2015 by A Nomad. Roses is a town which appears to have been built for summer vacations. Hotels and apartments line the beachfront, interspersed with restaurants and bars, but the majority are closed and I’m about to discover that Roses’ origins were not related to sunbathing at all. As I enter the town, a large wall forms on my left. 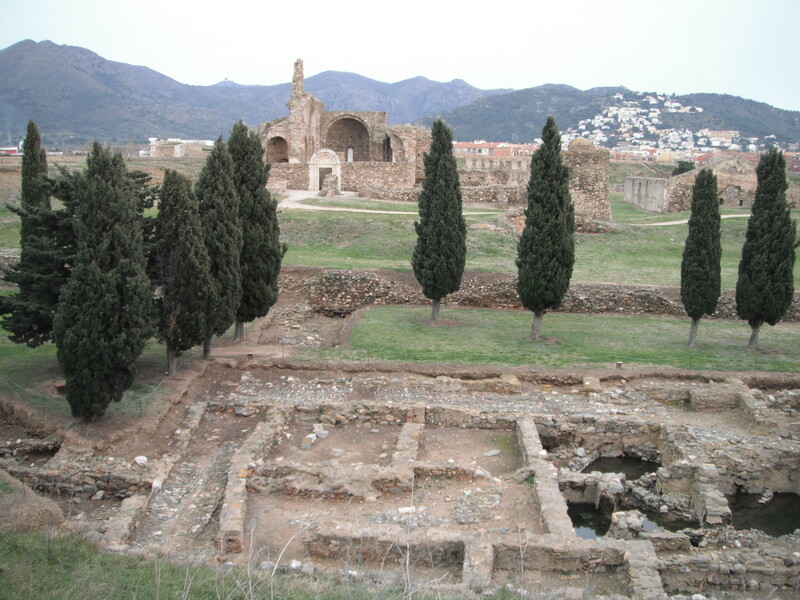 This is one side of the monumental citadel, inhabited by Greeks, Romans, Medieval monks and 17th century soldiers. It has also been systematically destroyed by many wars throughout the centuries and was almost turned into a housing development in the 20th century. Luckily, it’s still here to educate us about the town’s long history and to provide something to do on a less than perfect beach day. When I arrive, wrapped up in my fleece against the cold winter chill, I discover that in 45 minutes, and for only €1 more than the normal entry fee of €4, I can have a guided tour in English. While I wait, I visit the excellent museum which tells me about the history of the citadel, which was first settled by the Greeks and called Rhode, meaning rose, which is where the present day town gets its name. My tour guide is also called Roser (rose bush) and I’m the only client. We make our way past a group of happy primary school children, who Roser has just been educating, and head over to an excavated area of the Greek settlement. From her shoulder bag, my enthusiastic guide extracts a piece of Greek pottery and explains how it helped to date the site. I’m amazed that I’m allowed to handle a piece of ceramic that is more than 2000 years old. 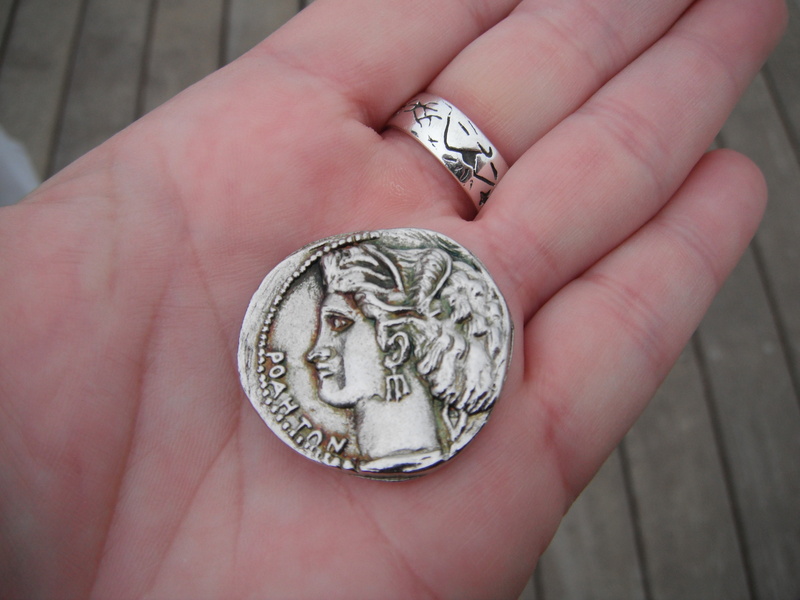 However, the silver coins that we also discuss are reproduction and probably not silver at all. Next to the Greek settlement is the Roman one. At one point this was the main port, though we are now some way from the sea. On slightly higher ground, a large church represents the site of the medieval village, part of which has also been excavated and I can clearly see the cobbled streets and walls of dwellings. The church has been partially restored. 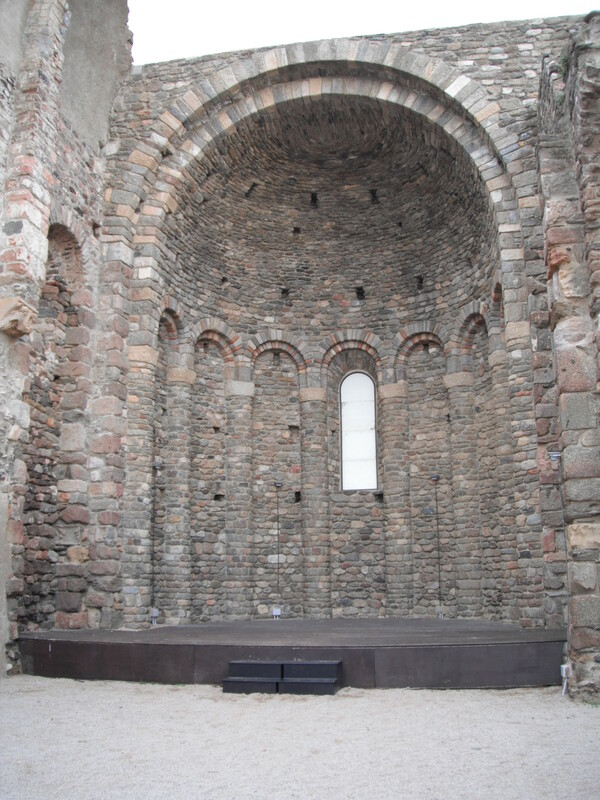 The multi-coloured stones, some recycled from the earlier settlements, are very interesting, as is the story of the destruction of the main apse. It’s easy to imagine that it was destroyed during one of the many wars and sieges of the citadel, but Roser tells me that it occurred in the 1930s due to a dispute between two local brothers which resulted in a fire. Part of the tour takes us along the high, thick walls of the 17th century citadel. Some areas were destroyed by Napoleon’s army, while others were destroyed by the town council and building planners for a proposed housing development in the 1950’s. Luckily, the archaeologists persisted in examining the site until they found something of historic significance that would stop the housing plans and, in the end, common sense prevailed over financial gain. The citadel and the ghosts of its inhabitants over the many centuries have been preserved for future generation to appreciate. Though, I suspect that most visitors to Roses would appreciate a cold beer or an ice cream much more. 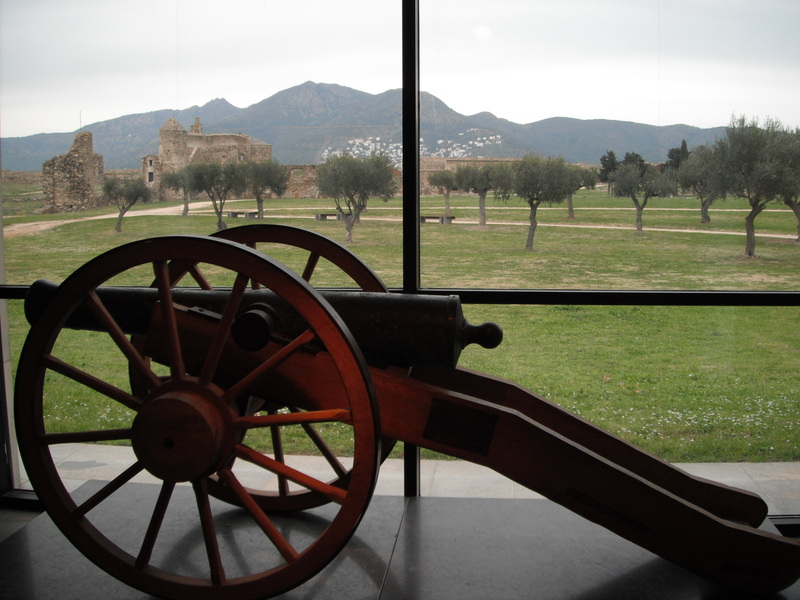 This entry was posted in Spain and tagged Citadel, European Nomad, Rhode, Roses, Spain on January 22, 2015 by A Nomad. After 24 hours of rain, I expect the city of Girona to be drowning, but the river which flows through the city is calm and the clouds have dissipated to leave clear blue skies. 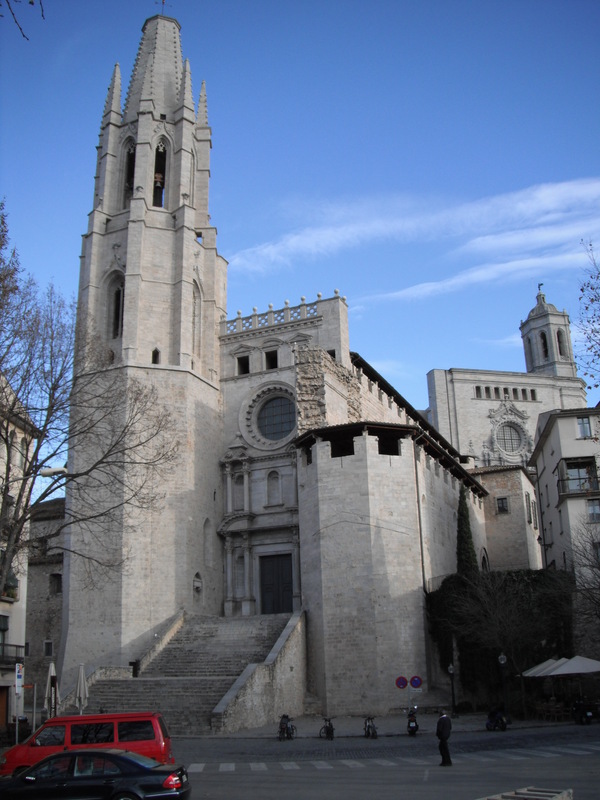 There are many museums in Girona and the main ones offer a discount scheme so that after visiting the first one, the others are half price. But I only have one day and I don’t want to spend it all inside museums. So, I limit myself to just two. 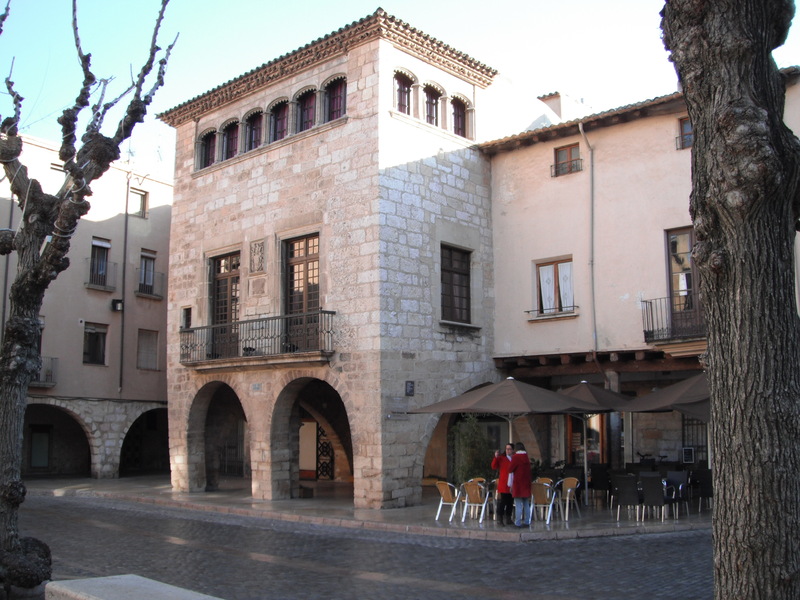 I start with the Girona History Museum in the hope that it will offer me some good background information. It is spread over 4 floors of a former Capuchin monastery and a self-guided route takes me from the first Roman settlement, through medieval times, the Napoleonic War and the Spanish Civil War. There’s an interesting section about music and dance, as well as the Capuchin cemetery were the deceased friars were left to desiccate. Just down the road, on the site of a Jewish Synagogue, is the Museum of Jewish History. 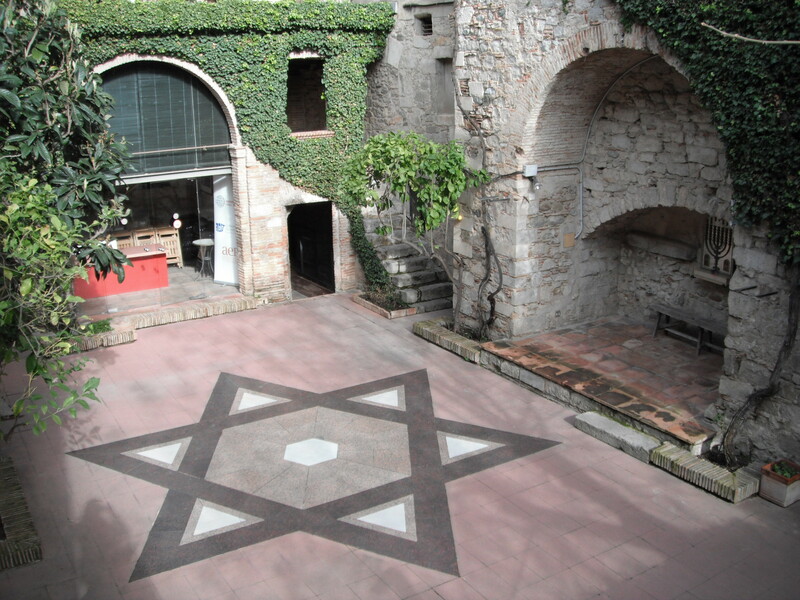 In the late Middle Ages, up to 800 Jews lived in Girona. They worked in many trades, including goldsmiths, blacksmiths, tanners and tailors. Unfortunately, well before Hitler’s promotion of anti-Semitism, the Spanish Jews were persecuted by the Catholic Church. Those that did not agree to be baptised and renounce their Jewish faith were executed. The museum displays several stone tombs, including one which was rescued from a local garden, having been used as a fish pond. 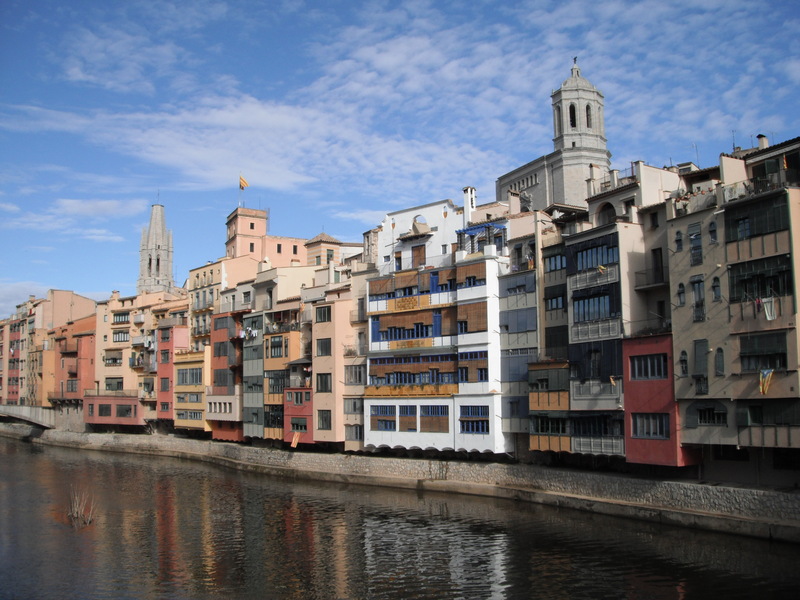 Having a better understanding of the history of Girona, I wander down to the river and, from the pedestrian footbridge of Sant Augusti, I have a good view of the tall, terraced houses which overhang the water. I end up having lunch in one with a wonderful view of the Cathedral and Sant Feliu Church. I choose from the menu del dia and end up with a unusual assortment of dishes, not all good. As the weather continues to bless me, I decide to walk the length of the city walls which stretch for over a kilometre around the eastern side of the city. They are very high and offer great views. I can clearly see the single towers of the Cathedral and Sant Feliu Church (in fact, they both look a bit lopsided, as if waiting to be completed) and beyond the red-tiled rooftops, the snow dusted peaks of the Garrotxa Volcanic Mountains. For me, it seems criminal to charge entry to a holy place and it costs me €7 to visit Girona Cathedral. However, this also includes entry to Sant Feliu Church and a very good audio guide describing all the main features in some detail. Unfortunately, Charlemagne’s chair and silver canopy are hidden under scaffolding and cloth while they are being cleaned. 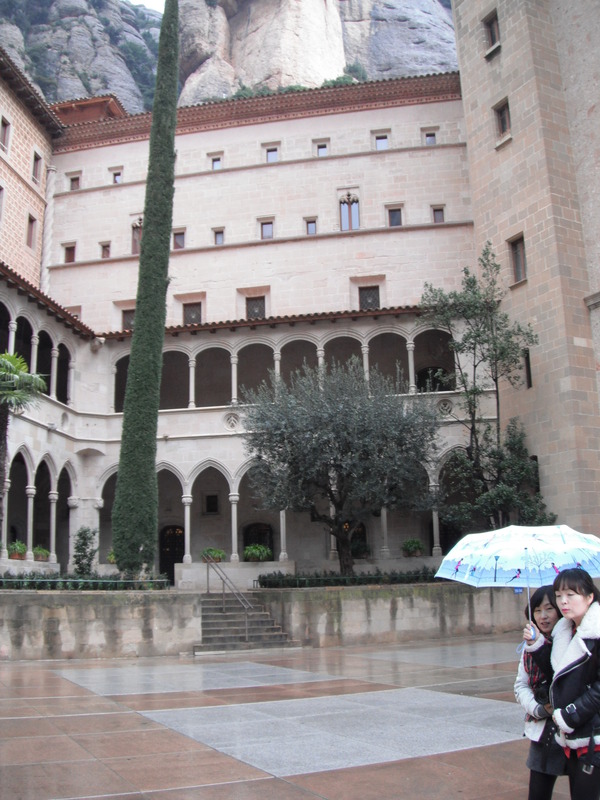 The cloister is peaceful with each column capitol telling a biblical tale; Adam and Eve, Cain and Abel, Noah and his ark. However, the best has been saved for last. 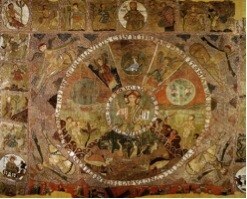 Hidden behind a panel at the far end of the treasury is the Creation Tapestry, a masterpiece from the 11th or 12th century depicting scenes from Genesis. 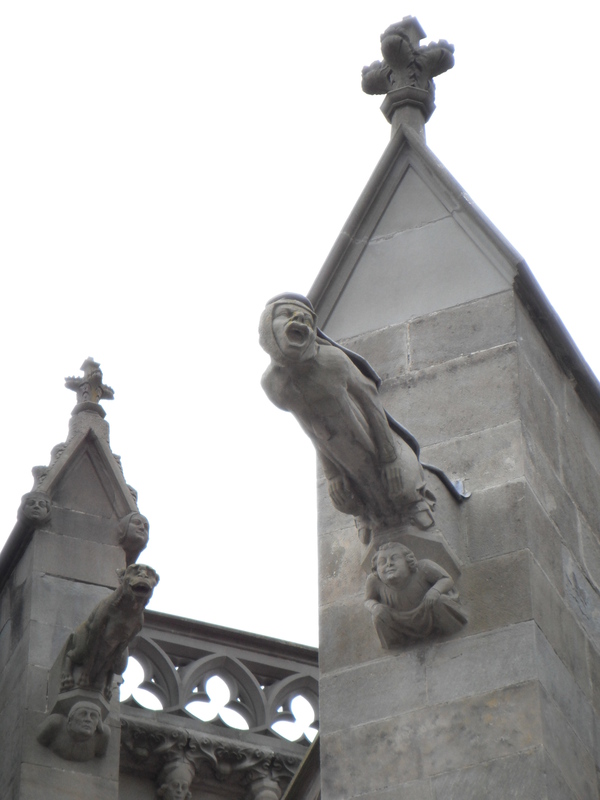 Sant Feliu Church also has some lovely features, detailed by another audio guide. 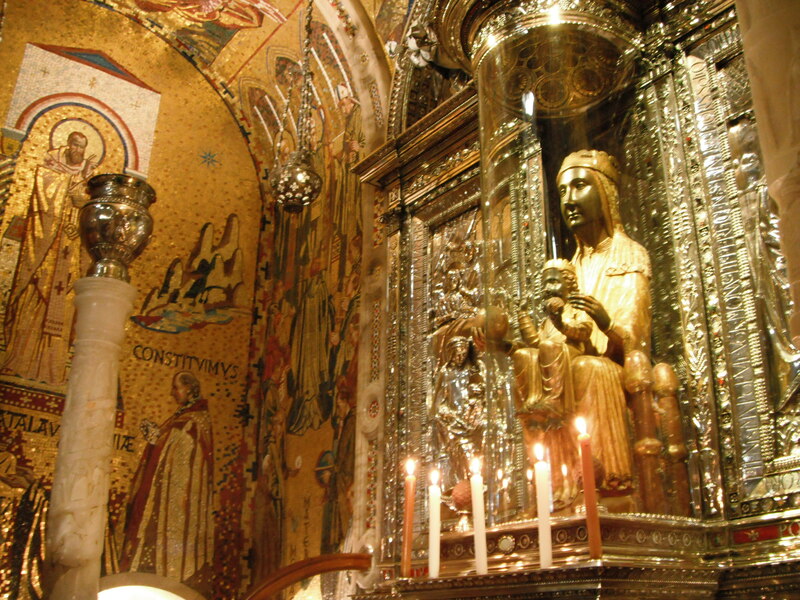 A large marble chapel is dedicated to St Narcissus, the patron saint of the city. 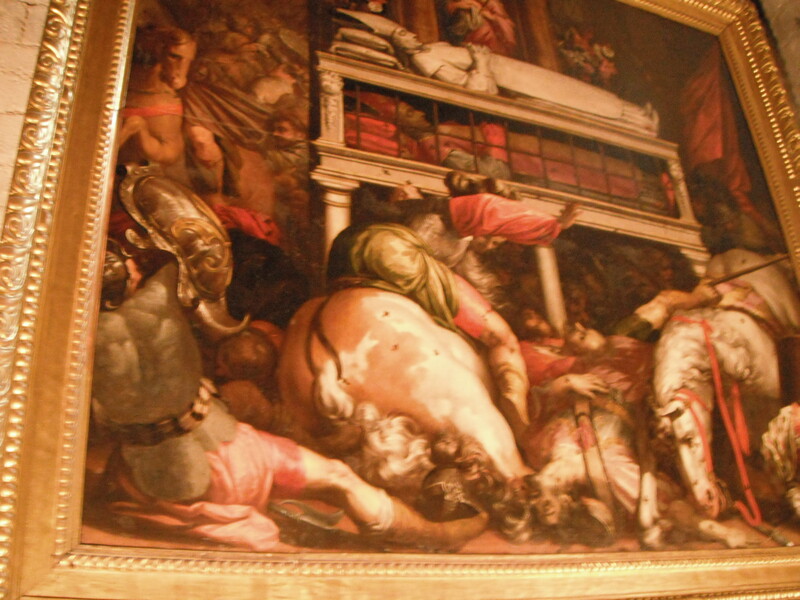 Above the silver casket containing the remains of the saint, is a large statue of him and on a side wall is a large painting depicting the miracle of the flies, when Sant Feliu saved the town from attack by the French in 1285 and 1653. Behind the main altar of the church, embedded into the walls, are eight 4th century Roman sarcophagi with detailed carvings of biblical stories and events. 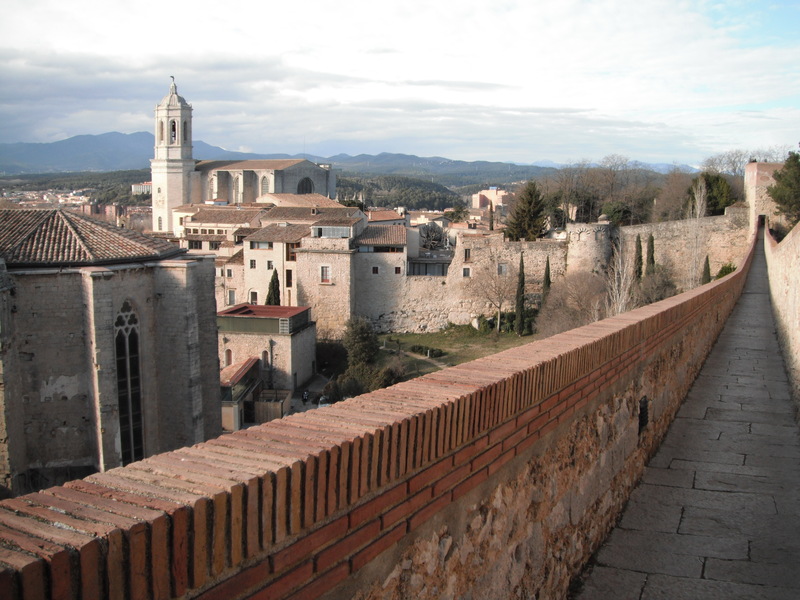 Girona is a fantastic place to spend the day, especially if you are on a tight budget. Both the Museums I visited had free temporary exhibits which were equally as good as the main museums. Walking the walls is free, offers fantastic views of the city and some good exercise. Access to the Cathedral is free on Sunday and the Jewish Museum is free on the first Sunday of each month. 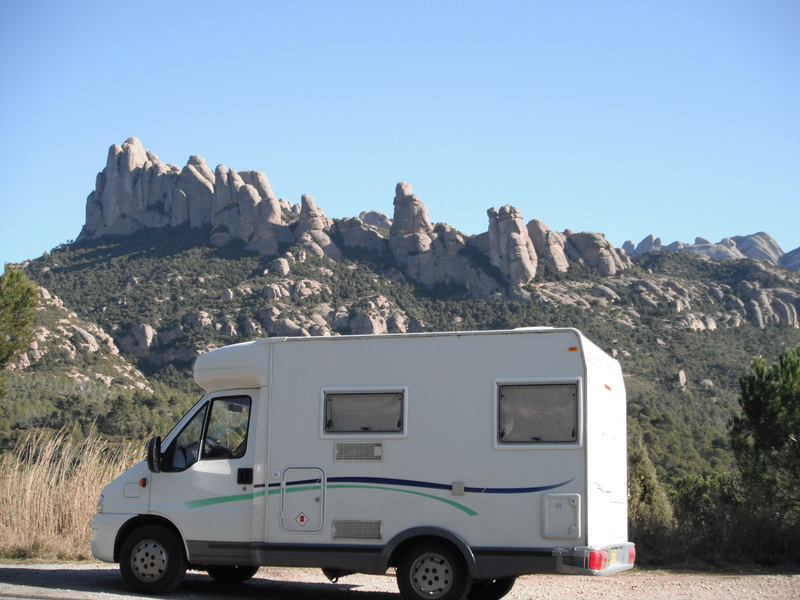 There are many free car parks around Parc de la Devesa, if you don’t mind a short walk back into the city and, if you’re looking for somewhere nearby to spend the night in a motorhome, the then village of Quart has a nice, free Aire and the picturesque, medieval village of Besalu allows you to stay in their car parks for free. 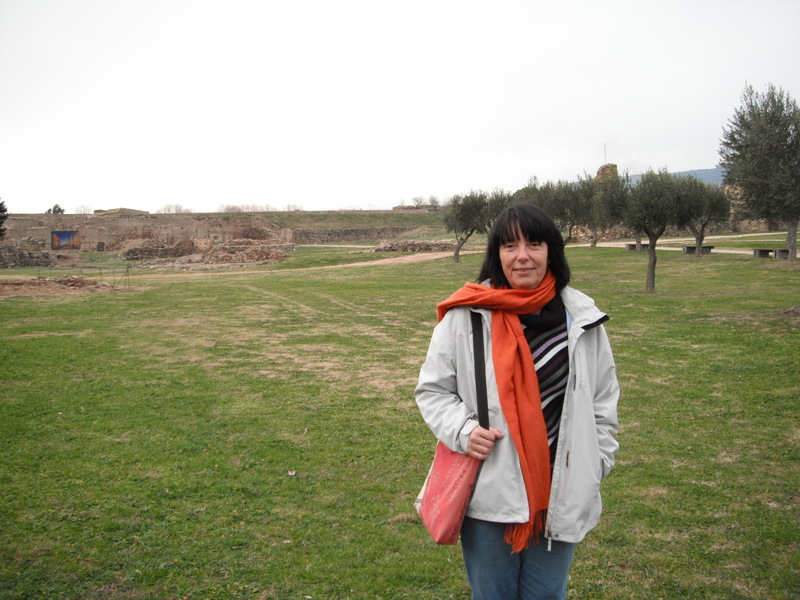 This entry was posted in Costs, Motorhome Tips, Spain and tagged Besalu, Catalonia, City Museum, European Nomad, Girona, Jewish Museum, Quart, Saint Felix, Saint Narcissus, Sant Feliu, Spain on January 22, 2015 by A Nomad. It’s very easy to fall under the spell of the medieval walled town of Montblanc. Peaceful cobbled streets lead from the gate towers to the central, main square of Placa Major, bordered by a gothic town hall, a former noble’s mansion and a simple fountain. Several cafes offer the chance to warm up with a coffee, and even in January, the outside tables are popular with local ladies, dressed in stylish coats and fur hats. Steps lead up to the 17th century baroque portal of Santa Maria la Major Church. It’s just approaching 10am and I patiently wait while a grey-haired lady opens the main door with a huge iron key, allowing me access to the interior which is pure 14th century gothic. There are some interesting wooden and stone carvings and a beautiful, stained glass rose window but I’m enticed by the possibility to access the roof for views across the town. Like Miravet Castle, I have to squeeze up a stone, spiral staircase before emerging under the large, cast-iron bells. From beneath the arched buttresses, I have a 360 degree view of the walled town and red, tiled roofs of the buildings below. The only downside, is the loud audio recording of screeching birds, seemingly designed to deter the pigeons from making a home there, but more likely to deter any potential human inhabitants to the surrounding area. 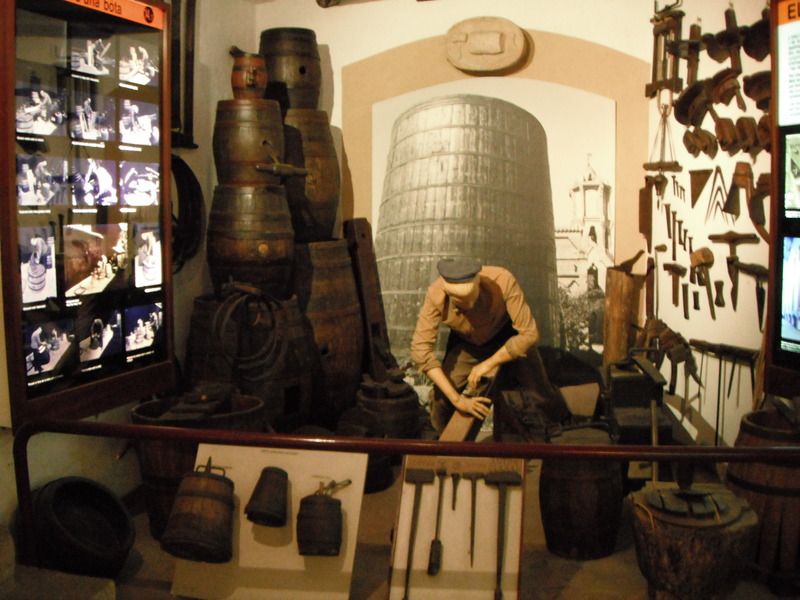 Next to the Church is the Regional Museum, with interesting displays of local trades, such as ironwork, barrel making, paper production and agriculture. Upstairs there are some history and art exhibitions, including some rather phallic Roman pendants. 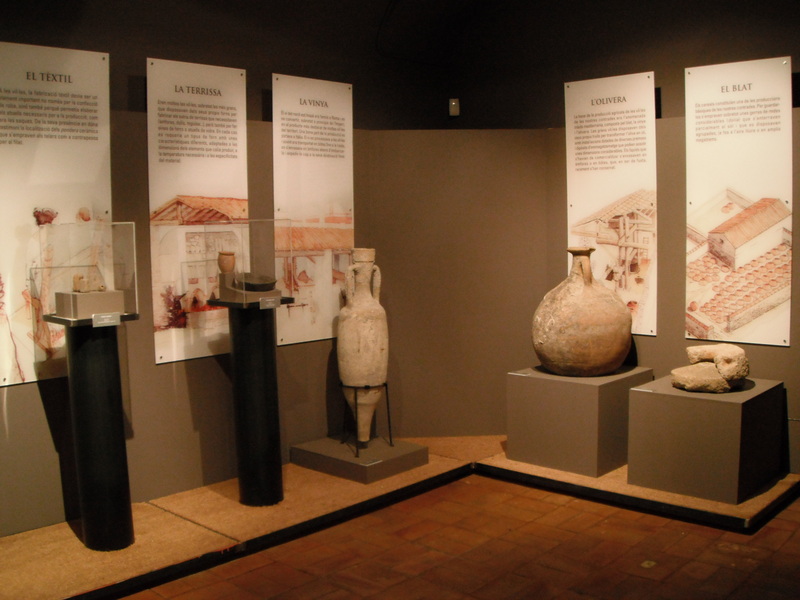 Nearby is another Museum dedicated to the interpretation of rock art. 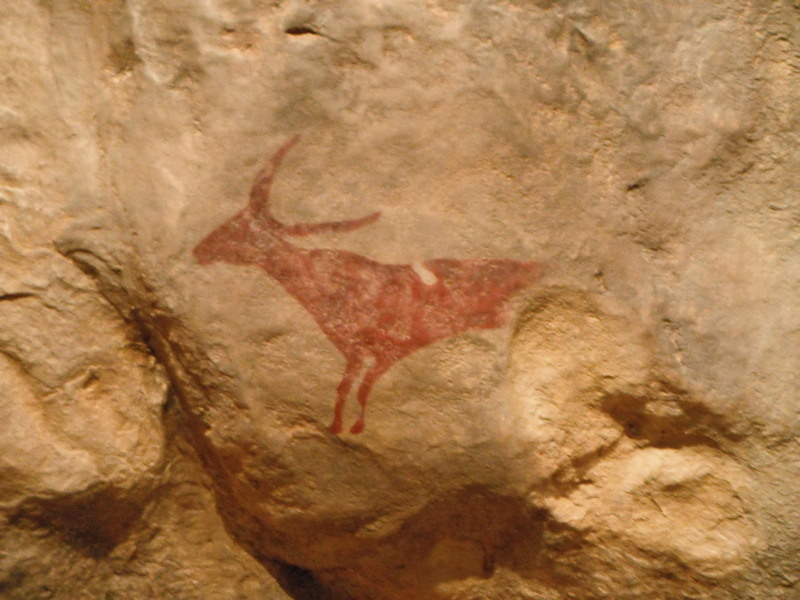 Several caves in the local Prades Mountains were discovered to contain Neolithic paintings of red symbols and hunting scenes and the museum displays life-sized replicas of these caves, as well as lots of information about other rock art from the Iberian Peninsula and the rest of the world. Having already visited the caves of Altamira and El Castillo in Northern Spain, I am fascinated by the wealth of information on offer here and inspired to visit more rock art sites on my future travels. 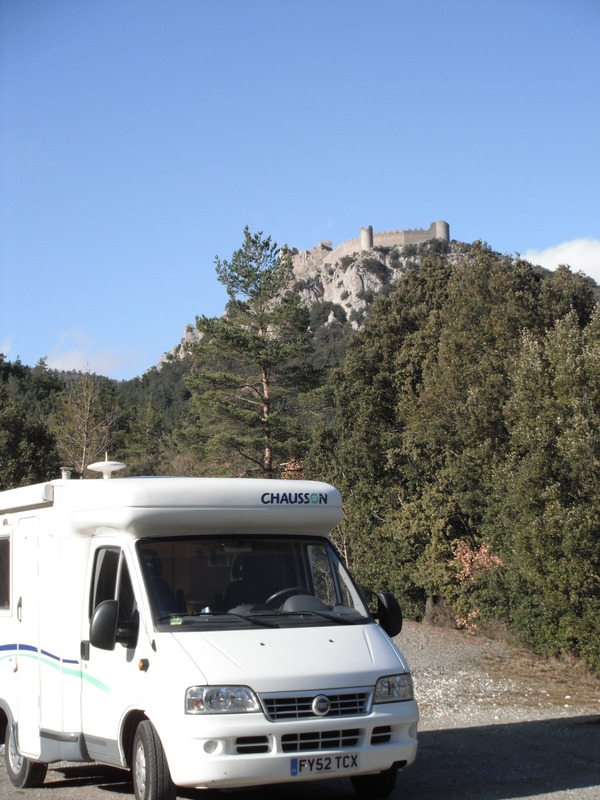 After spending the night in a small car park just outside the town walls, next to the Convent de la Serra, I drive out to the monastery of Poblet, at the base of the densely wooded Prades Mountains. 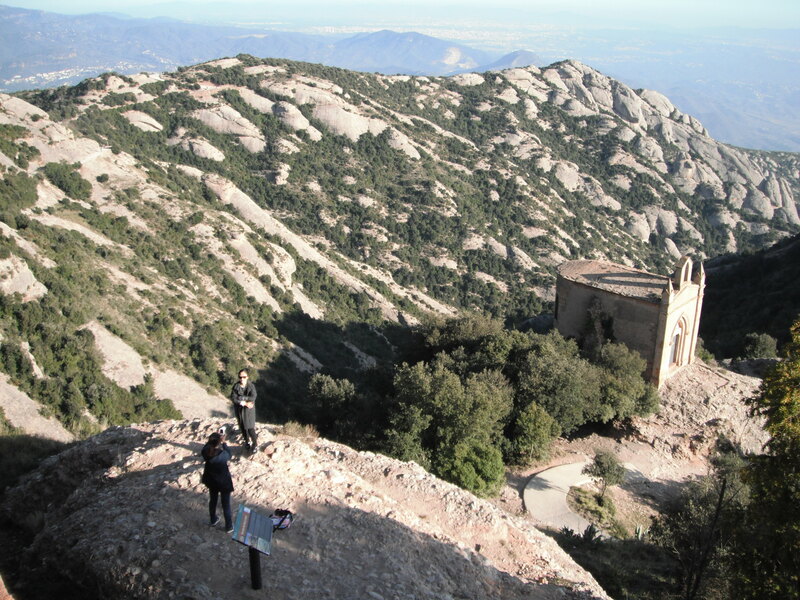 It is the largest of three Cistercian monasteries in the region, the others being Santes Creus and Vallbona de les Monges, and has been declared a UNESCO cultural heritage landmark. This may account for the expensive and, in my opinion, unjustified entrance fee. 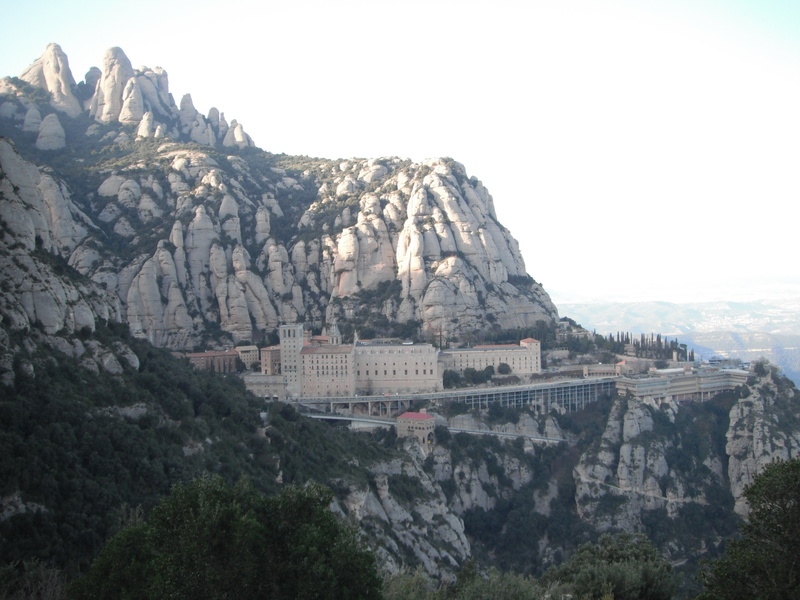 Founded in 1150 by the order of Count Ramon Berenguer IV, it was first populated by French monks who established an important spiritual and economic centre at the site. 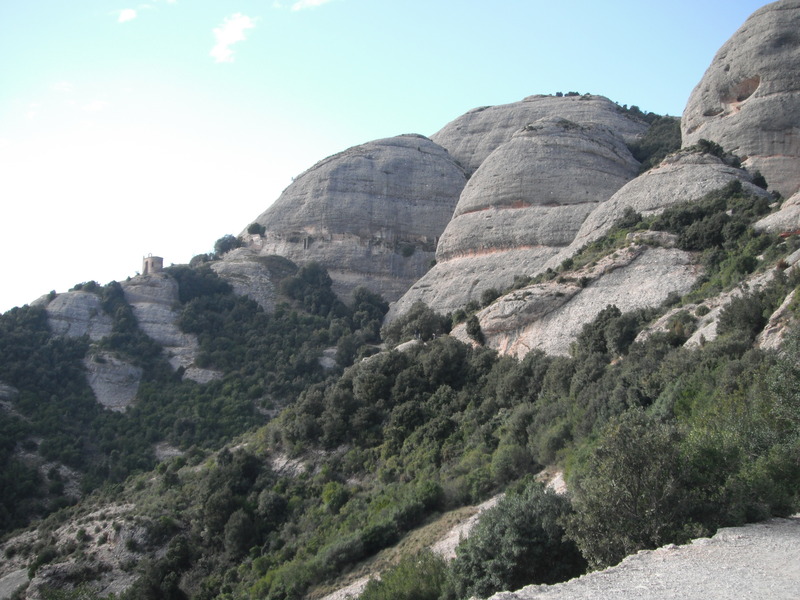 Even today, it is surrounded by vineyards and the powerful priorat wine is an expensive accompaniment to any meal. 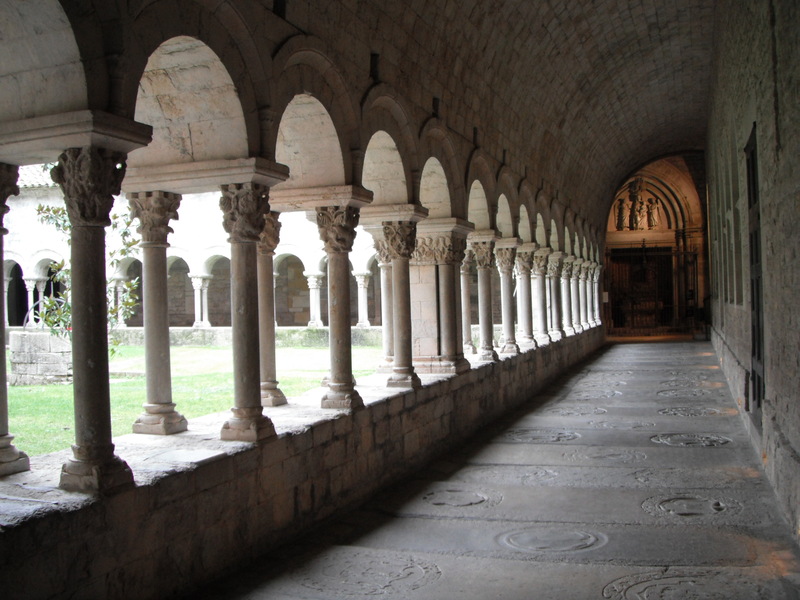 The monastery was abandoned in 1835 following the Act of Dissolution but a few Italian monks returned in 1940 and began the restoration of Poblet. 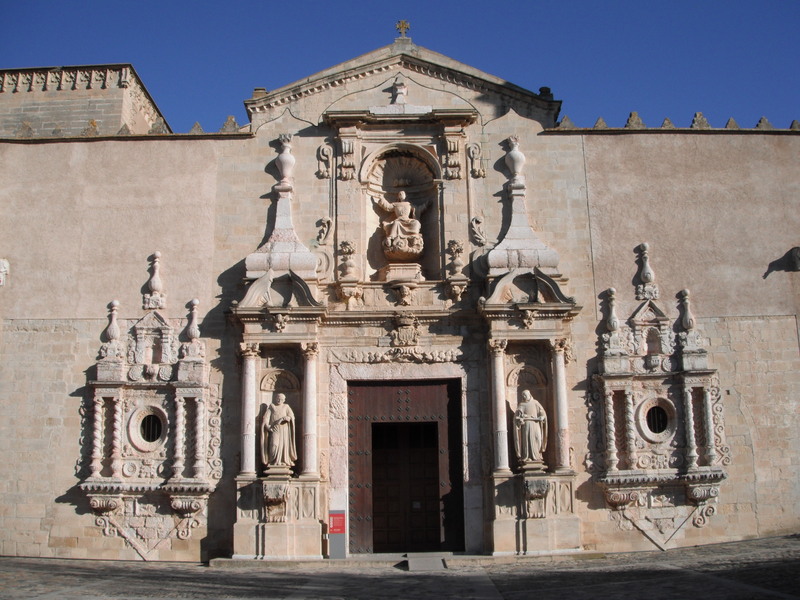 The main facade is very impressive with the twin towered Royal Gate and the baroque portal of the church. 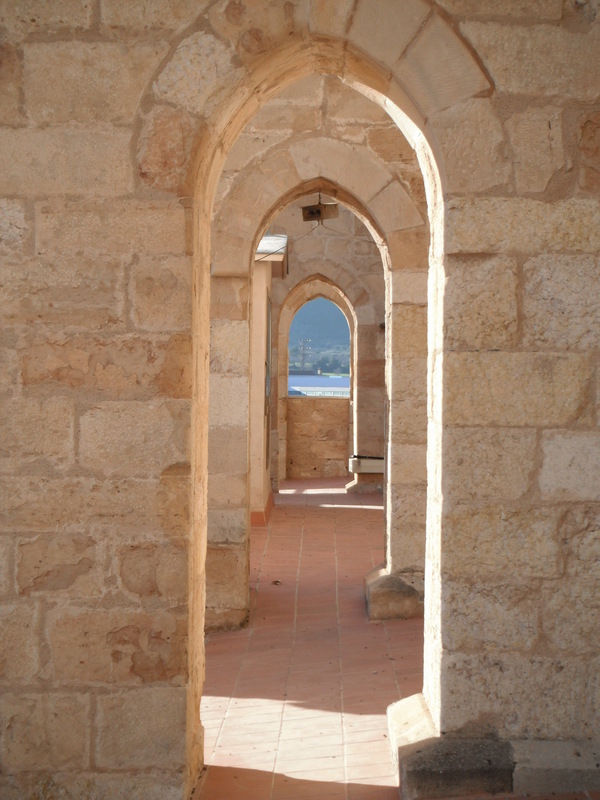 Inside, the main buildings of the monastery are simple and teach us about the daily life of the monks. The refectory is still used today and tables are laid up with cutlery, glasses and carafes of wine, whilst the library holds thousands of historical manuscripts but also a modern computer and printer. However, it is the church which holds the most historical and architectural interest. 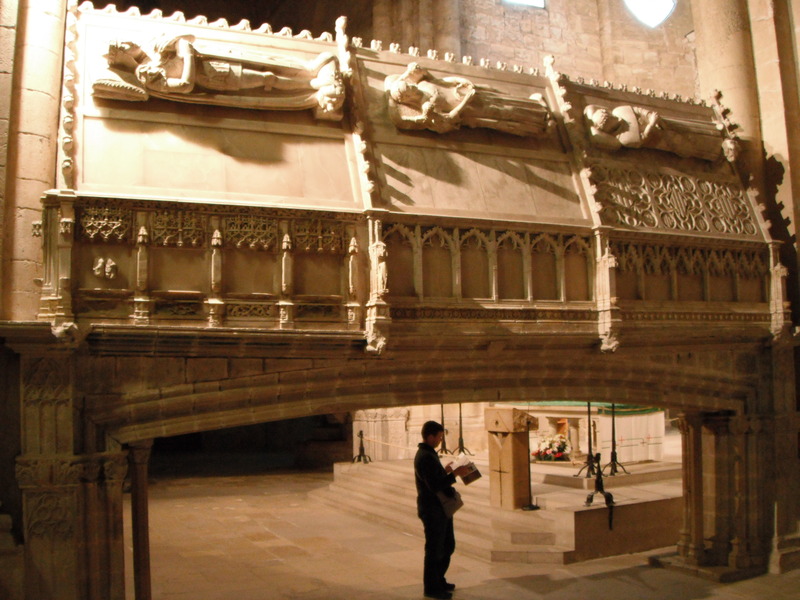 Lying upon two low, intersecting arches are the tombs of 8 Kings and 6 Queens of Catalonia and Aragon. They date from the 14th and 15th centuries but were carefully restored by Frederick Mares in the 20th century. 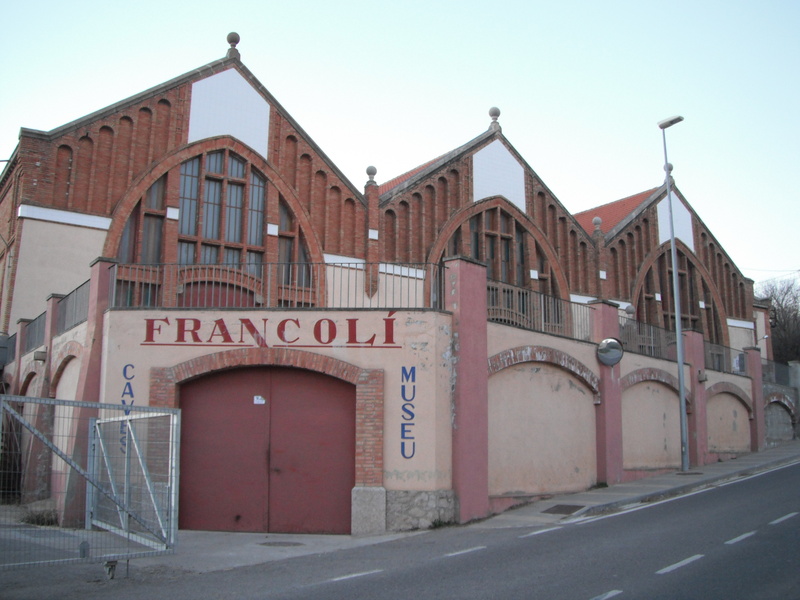 Back in the local village of L’Espluga de Francoli, I visit the art nouveau wine cellars of the Museo del Vi. There are many such buildings in the region, built to hold the vats of the wine cooperatives. I find the museum very interesting, even though there is no information in English. The wine tasting afterwards is even better and I’m especially warmed by the sweet, fruity moscatel. Luckily, I only have to stagger back to my motorhome, parked up for the night in a small car park across the river. This entry was posted in Art, Religion, Spain, Wine and tagged Aragon, Catalonia, European Nomad, kings, L'Espluga de Francoli, Monastery, Montblanc, moscatel, Museo del Vi, Poblet, priorat, queens, rock art, Spain on January 17, 2015 by A Nomad.